"The Golden Bauble is the absolute pinnacle of class and sophistication at a dinner party. It's also the perfect candlelit bath accompaniment. Or so I'm told! I only have a shower at home, but let's be honest, that probably won't stop me form having one in it. What makes this cocktail so special is the wide-rimmed circular glass. It spreads out the rich golden color and gives a certain sparkling glow. This little dash of gold looks great on any table spread." 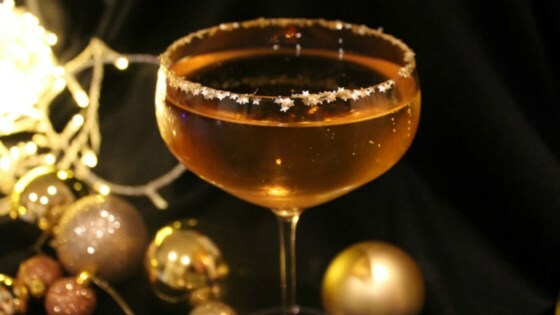 Rub the rim of a rounded cocktail glass or Champagne flute with honey and dip into golden sprinkles. Place a small dollop of honey at the bottom of glass. Add amaretto and gingerbread syrup; mix briefly. Add Prosecco and grape juice in equal parts to near the rim.